Childhood is a significant time for learning and growth. For a healthy individual to survive, they bond with mother caretakers. However in the wild when survival of the fittest is vital, how does this equation fit with two different species of creatures? Do the rules still apply? 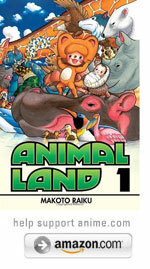 In Makoto Raiku's Animal Land, common sense is thrown to the wind, as a tanuki and a human baby embark on a parent-child relationship. 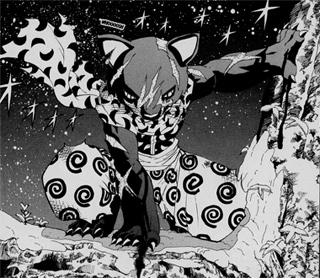 Monoko is an orphan tanuki living with her pack, surviving after the unfortunate deaths of her parents at the jaws of wildcats. In a scenario straight from the Book of Exodus, she rescues a basket floating down the river, and this is how she meets the baby boy who was abandoned by his real mother. 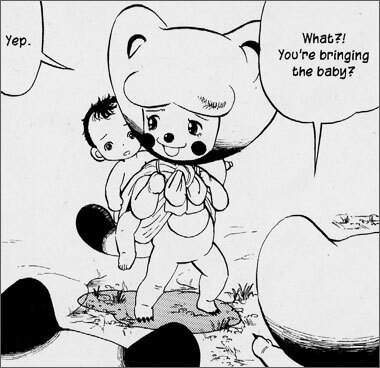 Other than the two dots on Monoko's cheeks, and reference to her gender, readers wouldn't necessarily know the gender of Monoko, but her dedication shines through as she adjusts to the baby and the baby with her. Her face is particularly expressive, as she pours out her honest feelings, with the subtly of a young child. 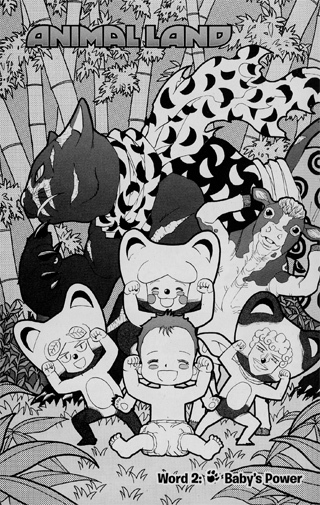 Now the baby is able to communicate with her and other animals, and this is a probable scenario due to his age and limitless potential to learn any language. 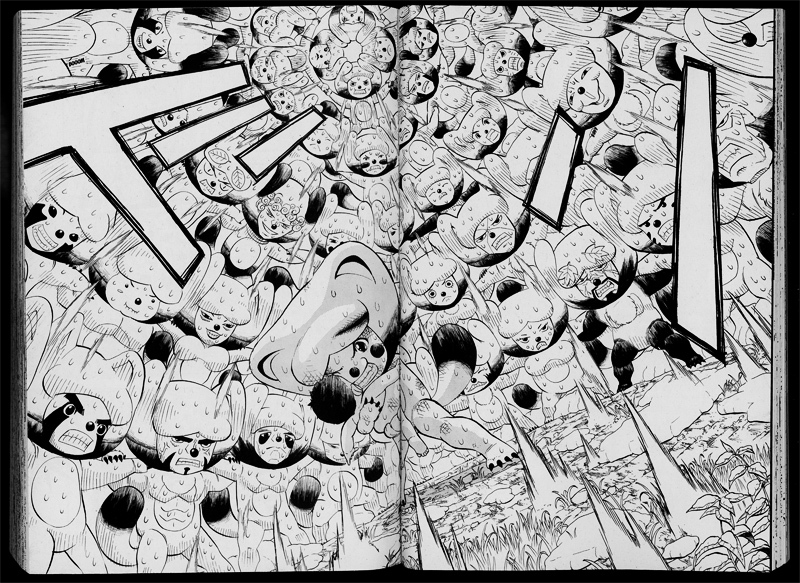 Makoto Raiku is definitely not a new mangaka to English manga readers. 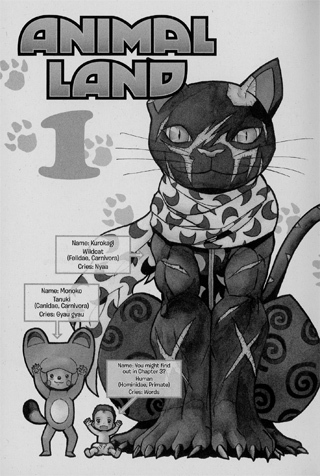 If you happen to enjoy the 33 volumes of Zatch Bell, then Animal Land is his current ongoing work at eight volumes in Japanese, and four volumes in English. If you happen to enjoy reading about the life of animals Chi's Sweet Home is a good read alike. 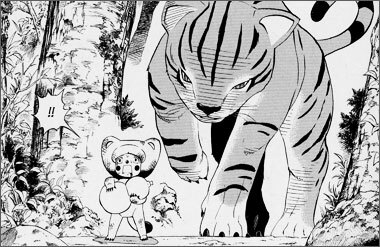 For those who enjoy reading the aspect of surviving among the wilderness, Gon is a better choice. Now if you want to read the caring of a baby by a teenager, then Beelzebub is the better choice. 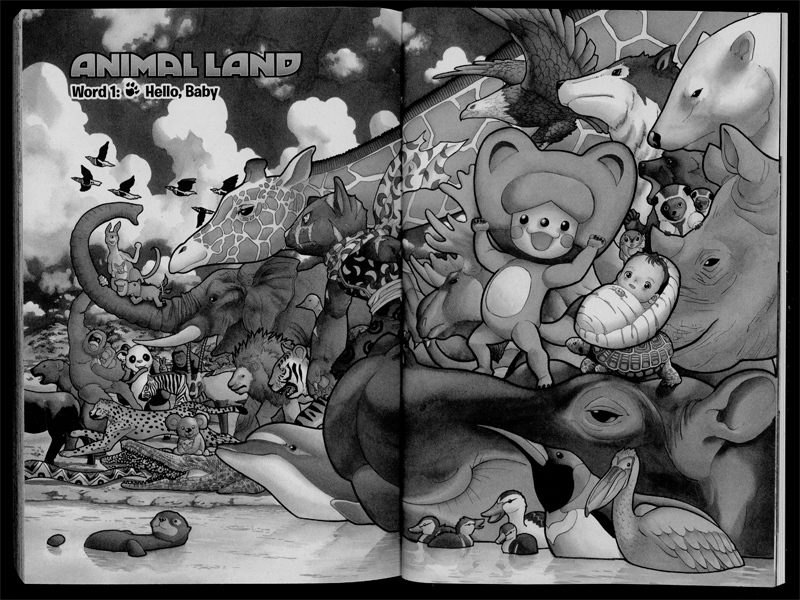 Animal Land proves to be an interesting read for those who want to see the bonding of a human and animal. 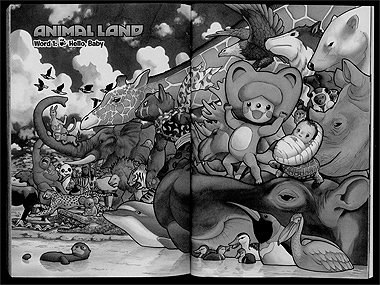 Below: Two double page spreads from Animal Land — to view each page at a larger size click on the image. Below: Illustrations for Animal Land.